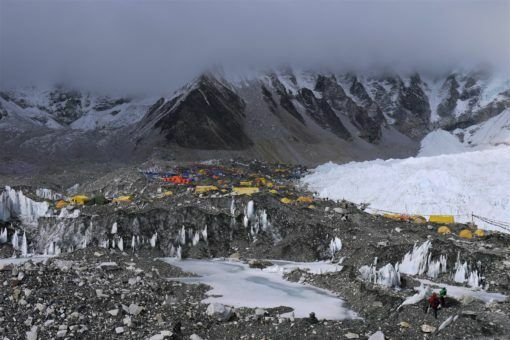 So far, six people have died this season on Mount Everest. I knew that climbing the highest peak in the world was a dangerous business, but just hiking to Everest Base Camp gave me a small insight into how terrifying the prospect would be. Simply experiencing the effects of the altitude at 5,365 metres had me literally gasping for breath, not to mention the sub-zero temperatures, unpredictable weather and possible mountaineering accidents you’d have to contend with. When you’re up that high in the stark, barren beauty of the Himalayas, you’re literally at the mercy of the mountains. 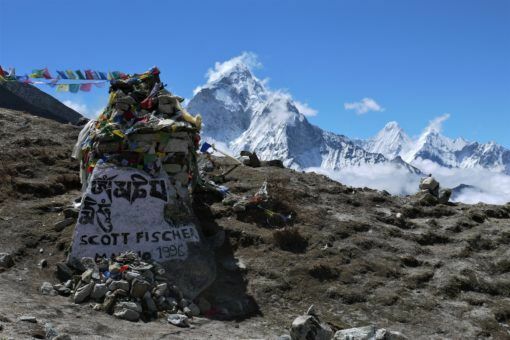 As many as 30,000 people from all walks of life trek to Everest Base Camp each year. We shared the trail with everyone from ultra-fit experienced trekkers to casual travellers, group expeditions and independent walkers, retirees and even kids. The trek is statistically very safe and if you have a strong will and a positive attitude, it’s an incredible adventure to take on. 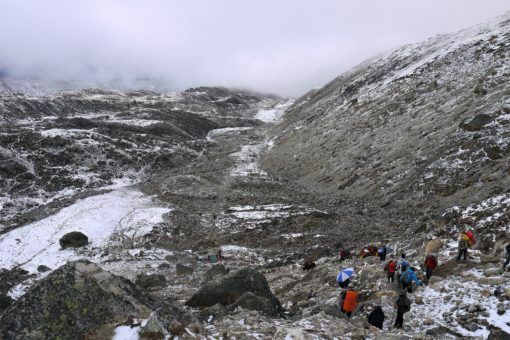 However, don’t go expecting a pleasant stroll in the mountains, the trek is much tougher than you’d imagine. Practically everyday I looked ahead at the path and thought: ‘I can’t do this’. Yet, somehow I did and not because I’m strong or fast, but because I’m relentlessly stubborn and had Andrew to feed me Snickers bars along the way! 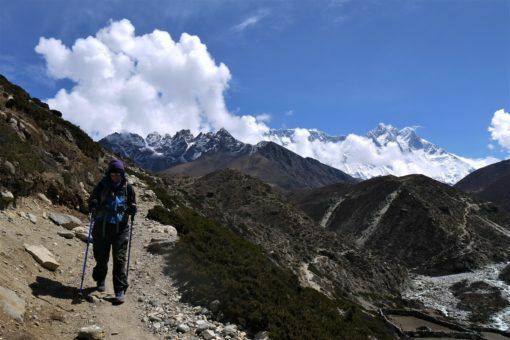 Here are some of the main challenges we faced while hiking to Everest Base Camp. The biggest danger on the trek is being at high altitude where your body gets less oxygen, which can cause Acute Mountain Sickness (AMS). This can be fatal if it develops into High Altitude Cerebral Edema (HACE) or High Altitude Pulmonary Edema (HAPE). We went to a great lecture at the Himalayan Rescue Association in Pheriche about dealing with AMS, and if you’re thinking of trekking at high altitude, their guide is a must-read. In short, there’s no cure for AMS but to descend and you should do so while you still can. Everyday on our trek we saw people being evacuated by helicopter or carried down by horse because they got so sick. Nothing can prepare you for what it feels like to be at high altitude and everyone has a different experience. Andrew coped relatively well aside from mild headaches, while I felt terrible once we ascended over 5,000 metres to Gorak Shep and Base Camp, the toughest physical day of the trek through snow. With a cold, pounding headache and no appetite, I went to bed before 8pm and woke a few hours later in a panic, the whoosh of my racing heartbeat in my ears. I sat up with my head thumping, gasping for breath. My pulse was over 100 and nothing I did could slow it down. At first light, we packed up immediately and began to descend, my vision was slightly hazy and every step felt like a monumental effort. We had a steep, rocky incline to tackle first and it was the only time during the trek that Andrew had to carry my pack for me. Fortunately, after that the path curved steadily downwards and by the time we reached Pheriche, almost 1,000 metres below, my symptoms had cleared up completely. Never underestimate the altitude, listen to your body and look out for your trekking buddies – it could save your life. I couldn’t have imagined a much worse start to our trek. 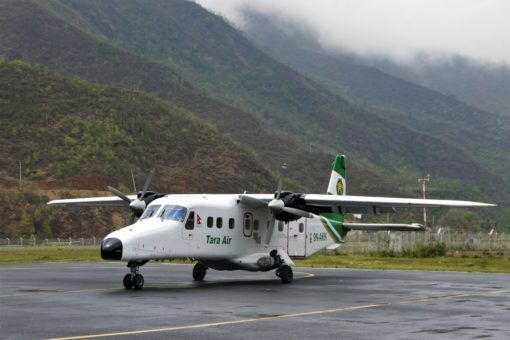 Rather than take an 11-hour jeep ride to Jiri, we booked a 30-minute flight from Kathmandu to Lukla, not realising that unpredictable mountain weather and Lukla’s short, dangerous runway mean that flights are frequently cancelled. We were delayed as rain lashed down in Kathmandu and we waited in the one-room departure lounge, amazed to see a huge macaque strolling around. Eventually, we got on the tiny, 16-seater plane and ascended into rain-darkened skies where we were battered so badly by turbulence that I threw up. Unable to land at Lukla, we were diverted for hours to an airport in the middle of nowhere before finally having to return to Kathmandu. If your flight is cancelled, you have to turn up at the airport the next day, wait for all scheduled flights and then hope the weather holds out long enough for you to squeeze on an extra flight. We were lucky and able to fly the next morning, but you could theoretically be delayed by days. When we flew back from Lukla flights had been grounded the day before so the airport was full of people desperately trying to get on a plane and it was a stressful experience. 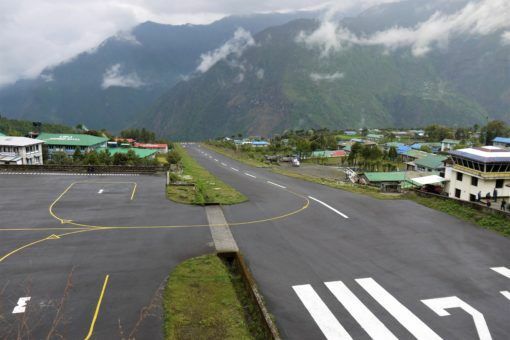 If you do fly to Lukla, leave yourself a buffer of a few days so that you don’t miss an onward international flight. Although April, May, October and November are the best times for hiking to Everest Base Camp, the weather up in the mountains can be unpredictable all year-round, so pack accordingly. We experienced scorching sun, rain, hail, snow and high winds; sometimes we had four seasons in a single day. Our rain gear was essential, as was a warm sleeping bag and down jacket, decent sunglasses and factor 50 sunscreen. The sun is incredibly strong and burnt our hands and faces horribly on the first day. According to a doctor at the HRA, Nepal is one of the worst countries in the world for stomach bugs. The bacteria is so virulent that it’s resistant to many antibiotics and food hygiene is questionable, especially in the higher up villages where there might not even be running water. 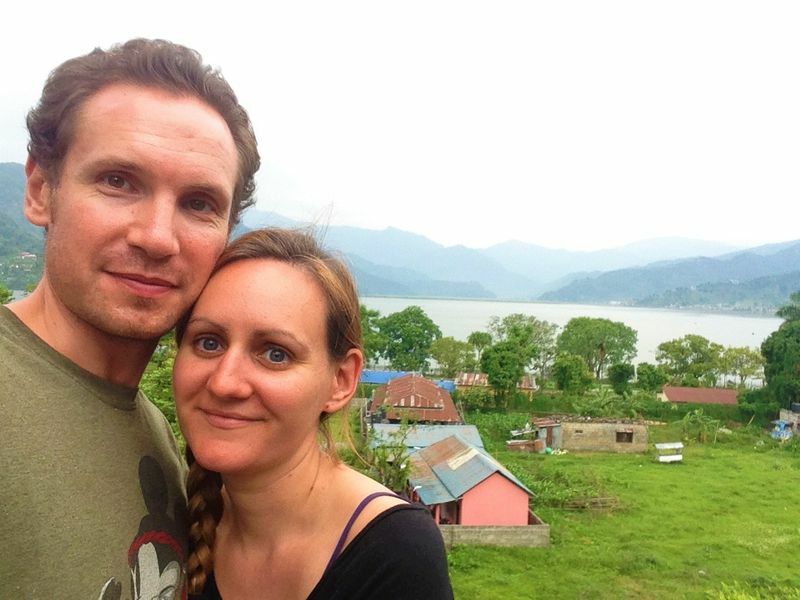 So, it’s no surprise that Andrew and I both had stomach troubles for most of our Nepal trip. What made this even worse was the poor conditions in the tea houses, which deteriorate quickly the higher up you go. In Lobuche and Gorak Shep we had to contend with filthy squat toilets, limited or no running water and expensive, yet pretty dire food. There are no roads on the trek so everything has to be carried up by porters and not much grows up there apart from potatoes, so we had no fruit and very little vegetables for two weeks. Our diet was all carbs, eggs and chocolate and I wished we’d taken some multi-vitamins with us. The teahouses offer little protection from the bitter cold and I usually slept with my clothes and a hat on in a minus 15 degree sleeping bag. The only heat usually came from a yak-crap fired stove in the dining room, which we spent most of our evenings in. I quickly got a streaming cold and later a cough, which I’m still recovering from. Be prepared to pay a relatively hefty price for hot water, toilet paper, battery charging and even water in the tea houses. 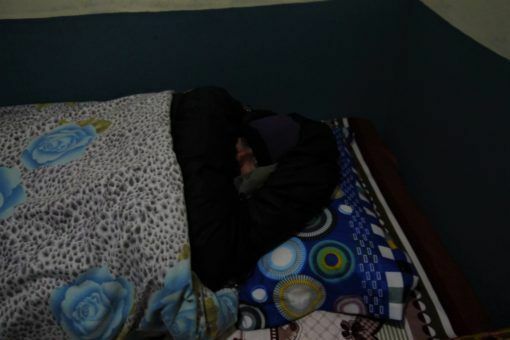 It can be hard to get a good night’s sleep with other trekkers snoring and stomping around in the creaky, thin buildings. 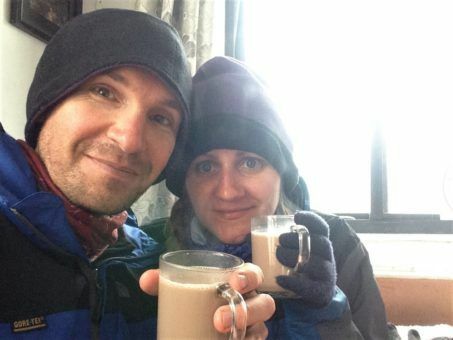 By the end of the trek, we were desperate to get back to a nice hotel in Kathmandu with hot water and flushing toilets. Aside from all this, you have the physical challenge of the trek to deal with. Although the trail from Lukla to Base Camp is just 62 km long, it’s rarely flat and there are some killer hills to contend with as well as sheer drops and boulder-strewn paths. You have to concentrate on your footing and deal with the breathlessness of hiking at altitude; it’s definitely the toughest physical challenge I’ve ever faced. Oh, don’t forget to watch out for yaks too, keep on the upper side of the track as they can barge you off the trail while passing. We suffered from the usual trekking aches and pains and I got a few blisters, but the hardest thing by far was carrying my backpack. 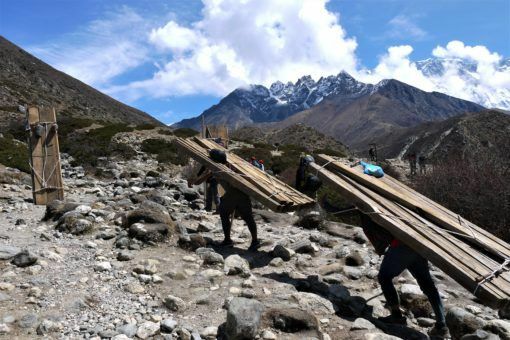 Many people hire porters to carry their things for them, and while we considered this, we ultimately decided to tackle the trek completely independently. At times, this felt like a crazy decision when I was struggling uphill with my bag pulling me back and other hikers with porters were breezing past with tiny day packs. However, carrying our own stuff saved us between $15-20 a day and although I cursed my pack at the time, I’m proud to have carried everything myself. We were very careful and took only the bare essentials with us, so I carried six kilograms while Andrew had between nine and eleven kilograms depending on how many litres of water we had. After facing all of these challenges, I count making it to Base Camp as one of the biggest achievements of my life. Now, whenever I have to take on a physical challenge I’ll remind myself that it couldn’t possibly be tougher than hiking to Everest Base Camp! How much did our Everest Base Camp trek cost? 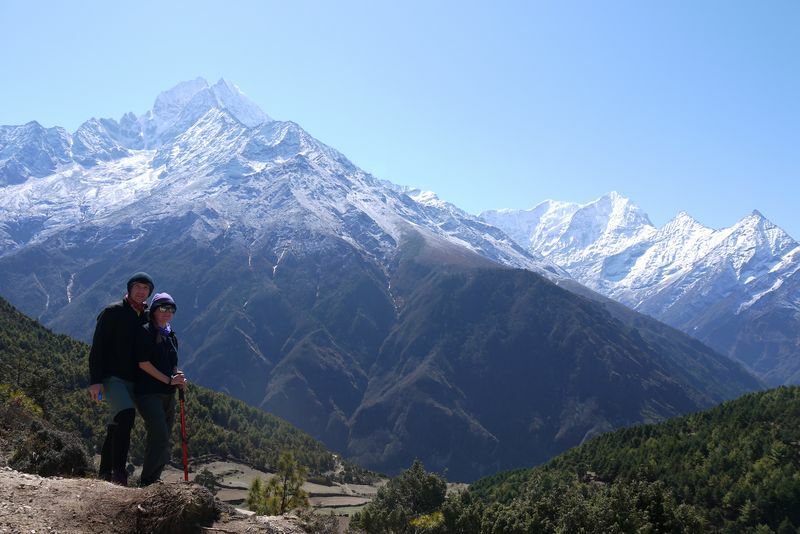 Have you trekked in Nepal? What were the biggest challenges you faced? Yeah but come on, it’s freaking awesome!! Yes, Nepal was the sickest the kids had ever been, and if you know us you’ll know they’ve been to over 50 countries, including India. I escaped it, Chef had a dose, giardia probably by the eggy burps, but he recovered without drugs. 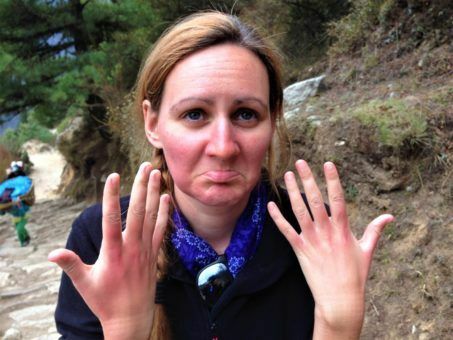 I’ve never had serious altitude problems, Chef had it pretty bad in Peru, headaches that saw him begging for a bullet. On the Annnapurna circuit I had this weird blue flashing light thing and had to lie down with my head down the trail, it went away, but I know how totally weird and disorientated it makes you. D and I are still going to Base Camp hopefully, he really wants to get up there ( bragging rights, he says). For me it’s spiritual,and I’ll have a good cry over those graves. Turning back at Tengboche last time was crushing, I just love it up there. He’s 12, I’ll be 50. Age is no barrier. Good on yas! Hope to catch you in London over summer, if you didn’t know we’re leaving Romania for good next month, mixed feelings, but it’s time. Yeah, absolutely! As I mentioned before, trekking to Base Camp is one of the best things we’ve ever done and I don’t think we’ve ever seen anywhere more beautiful than the Himalayas. However, the trek did totally knock us out, it was so tough and I wanted to try and capture those challenges in writing before time passes and I forget about the hardships 🙂 The altitude in particular was really hard above Gorak Shep and I found it quite scary. Trekking back down we couldn’t believe that we’d managed to walk up such difficult passes on the way! Good luck with your trek to Base Camp, I know you guys can make it and it’ll be amazing. Yes, we’ll be in London house sitting in July and again in September so we’ll hopefully catch you then? I need to catch up on all my blog reading, will check out your news asap! I was looking forward to this post, since both Brian and I really want to do this trekking. I have no doubt it must have been incredibly hard, well done you for not giving up. Altitude sickness sounds awful, I can’t imagine how hard it must have been to gather the strength to carry on? Did you stay overnight at the basecamp? How amazing to be there next to the highest Mountain on earth. Was it easy to find a tea house every night? Brian and I have a very sedentary lifestyle with mostly desk jobs, we would need to get a lot fitter first before we attempt something like this. I hope that you are having a lovely long rest now? Wow. I am still just not sure it’s for me but I am so impressed with you guys for doing it!!! That flight sounds terrifying. And the trek sounds incredible, eventful, challenging and rewarding. Congrats guys, I’m really not sure it’s a challenge that I’d take on. Mount Everest is tough. I haven’t yet been there myself but I’ve read enough from other people to know that it’s not something to take lightly. It’s awe-inspiring, beautiful, and yet, extremely dangerous. I would love to do a hike up there one day, However, I have to be realistic. I’m not as young as I once was (Eek), and I have asthma bronchitis! It doesn’t affect me on the day-to-day as I’ve had it from birth. I hiked up a live volcano a few years ago, and while my teen skipped along, it almost killed me! I ended up in tears, the guide had to carry my day-bag, and my knees went out! And I thought that was tough! Everest is another kettle of fish entirely. I would be walking extremely slowly, and using the porters! Although the flight is the logical way to get “further up”, I’ve heard about the flight challenges, and I don’t like tiny planes. I fear I’ll be going up by donkey! Well done for making it you guys. You’re my heroes! Well done Amy and Andrew!! Your descriptive writing takes a reader right there with you. Thanks for sharing this special adventure, that many of us can only dream about. Kathmandu has been on my bucket list for a long time, and then I read about the filthy conditions, pollution and tourist vendors and scrapped that idea. I would like to know if you prepared physically for this trek? Did you build up stamina and muscle beforehand by climbing smaller mountains? If not, would that have made the trek easier? I have been following your adventures for the past year…and it was because of you two that I ventured to go teaching Engish in Vietnam, at age 68. 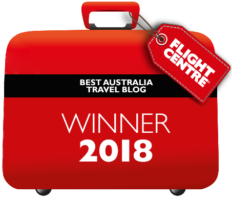 I love travelling but at times the constant stress and challenges of adapting, relocating and finding suitable semi-permanent accommodation can be overwhelming. I’m now in Dalat Vietnam where the weather is sublime….considering it’s mid summer! Hi Pat, thanks so much for your kind words. Yes, we didn’t really enjoy Kathmandu to be honest but it was worth going there so that we could get on to the Himalayas. We didn’t prepare physically at all really! If we had, I’m sure it would have helped but the main issue was trekking at altitude, which isn’t something you can really prepare for. Thanks so much for following our journey and I totally get what you mean about the challenges of travel! It’s great to hear that you’re in Vietnam now, I hope you’re enjoying Dalat – we loved it there! Such a honest review of the trek. It sounds so hard yet it must be so worth it. Very impressed you carried your bags! I do think you are slightly crazy ? That must have made it so much harder. Sounds like you owe a lot to Snickers. Sometimes chocolate is the only thing that can keep you going. I remember when the 4 of us met in Washington, DC and you asked questions about our Camino walk and I remember you said you didn’t think you could do it. 🙂 Well, let me tell you, what I just read about your Everest trek made my 350 mile Camino journey seem like a cake walk. Incredibly happy for both of you, what an amazing gift you gave yourselves! This sounds amazing! I wanted to do the Annapurna Circuit, but it sounds like some renovations have made it far less scenic. EBC has scared me so much, it sounds HARD and altitude sickness really worries me. How long did the trek take you? Hi Kristen, it took us 14 days, including some rest and acclimatisation days. It was hard and we did experience altitude sickness but it was so worth it. Really, the trek is quite safe so long as you are well prepared with gear and make sure you acclimatise as you go. I would definitely recommend it, the scenery is unreal and I already look back on it as one of my most incredible life experiences. Go for it! It’s probably a good thing that the trekking people I’m going with have given me no choice – guide and porter no ifs and buts. I’ve read many articles on this trek and still have questions. When you get to base camp, where do you stay? Are there tea houses near Camp or do you pitch your own tent? Hi Shane, thanks for your comment. We have a detailed break down of our entire EBC itinerary in this post, which includes names of tea houses we stayed in and their cost: . The short answer is that there are a couple of tea houses at Gorak Shep which you stay at, drop off your stuff then hike the extra 45-1hr to Base Camp and come back to sleep at Gorak Shep. Any more questions, let me know. I loved the Everest Base Camp trek! 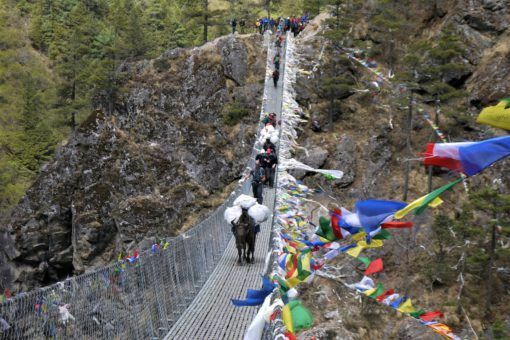 Hiking Everest Base Camp looks and sounds really challenging. I am so sorry that Andrew has gotten stomach bug and that you have had colds. I don’t think I could ever survive a hike more so of Everest! 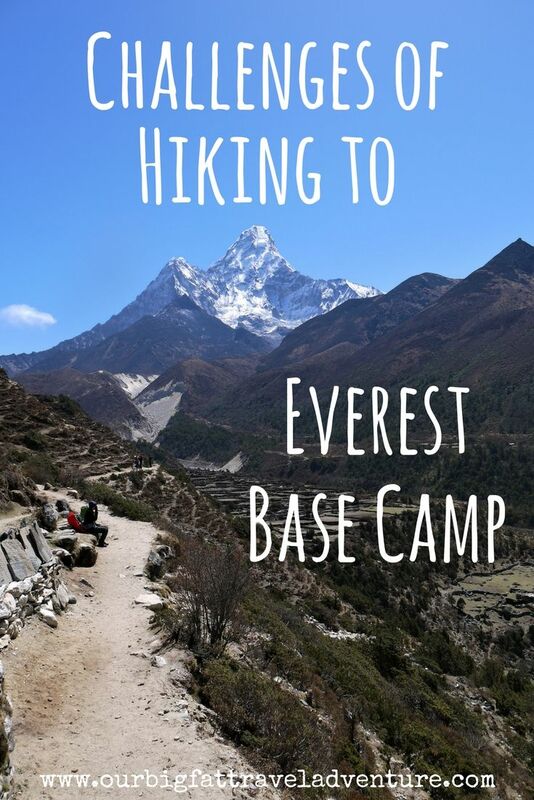 Thank you for sharing your story, this would help a lot of hikers who plan to have an adventure in Everest Base Camp. This trek was awesome! Himylayan Wonders was so helpful from start to finish! They are concerned with safety and making sure you reach base camp! We laughed, cried, and found strength to reach base camp. I would recommend this company and this trek. The trek is worth it through and through. Nil our guide was great! Hi Olivia, just to clarify, we didn’t trek with Himalayan Wonders, we completed the EBC completely independently without porters and guides.